If you would rather not send flowers to wish best wishes on the birth of a new baby, why not give a new baby and new Mum pamper gift basket instead or even some champagne to celebrate the new arrival. Our baby and Mum pamper gifts include the new baby products and pampering presents for the new Mum too. A great way to say congratulations, help out and treat new Mums at the same time. To spoil a new Mum and new baby send one of our new baby and new Mum gift baskets, gift wrapped for you and sent with a gift card personalised with your own message of congratulations. As well as the combined Mum and baby gifts shown below, we also offer a wide range of pampering gift ideas which make great presents to treat new Mums or Mums to be. Presented in a large silver gift box with a magnetic lid, matching purple ribbon and a silver bow. 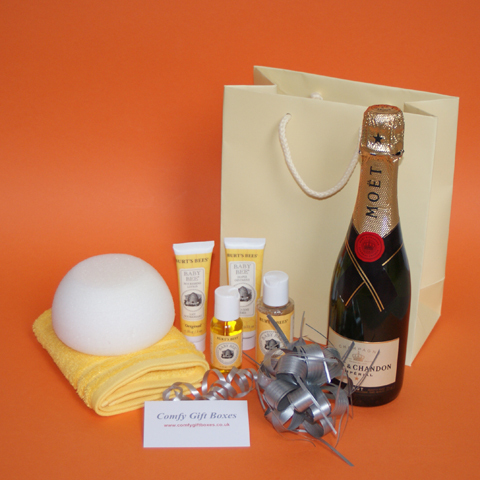 Pamper the Mum to be from head to toe with this new Mum pampering gift box. We are sorry, this gift is temporarily out of stock. Presented in a white gloss gift box with lid, yellow ribbon and a matching yellow bow. A bright pamper gift for both the new Mum and baby. Also available with Möet & Chandon Champagne. Presented in a cream gift bag with matching rope handles and yellow tissue paper. Some sparkly bubbles for Mum and some gentle pampering for baby. 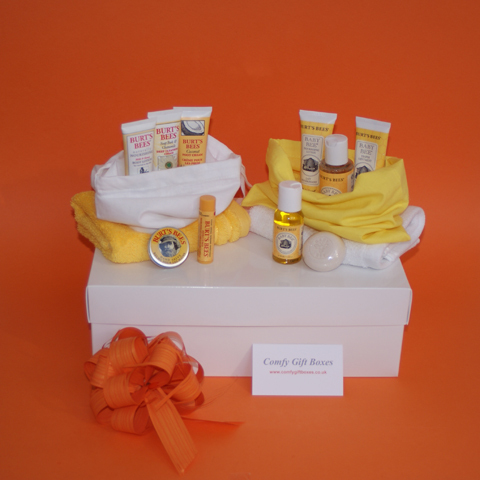 A pamper gift box especially for the new Mum and baby to help them both relax. Presented in a wicker gift basket, wrapped in cellophane with a bow. Treat Mum and baby to a home spa by sending this new baby gift basket. Presented in a white wicker basket with white cotton lining and wrapped in cellophane with ribbon and a bow. 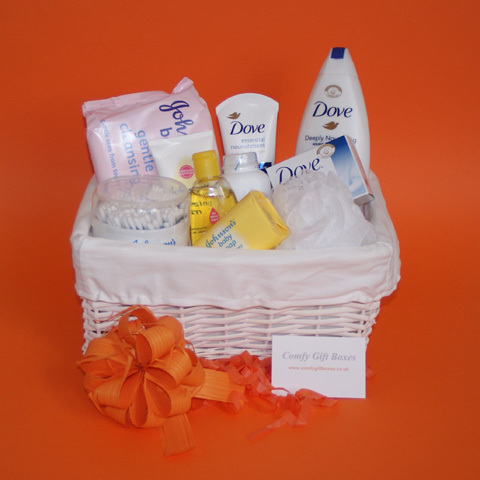 Spoil the new Mum and baby with this pamper gift hamper.